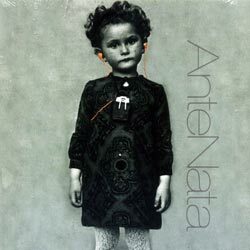 Antenata is an Italian band that started with a meeting between Sabina Meyer and Daniella Cattivelli in the early 90's. Cattivelli, who plays saxophones and samplers, is known from the Italian groups Laboratorio di Musica e Immagine, Fastilio, and Mylicon/EN. Meyer, vocalist and theremin player, has worked with Elio Martusciello, Tristan Honsinger, Ig Henneman, Ab Baars, Alvin Curran, Paul Lovens, and Marianne Schuppe, amongst others. The recordings are from 2001, and were spawned from the intention of setting poems by important female poets who led unusual lives: Ingeborg Bachmann, Patrizia Cavalli, Marina Cvetaeva, Meret Oppenheim, Sylvia Plath, Anne Sexton, Patrizia Valduga and Simone Weil. They are joined in this endeavor by a set of musicians from the Bologna scene: Angelo Berardi on violin, Aleksandar Caric on guitar, Pierangelo Galantino on doublebass and bass, and Fabrizio Spera on drums and electronics. The music is an incredibly diverse set of ideas that include chamber rock, jazz and improv, experimental electronics, sophisticated pop, classical/chamber music, spoken word, sampled poetics and electro-acoustic music. Often in the same piece. The pacing of the release is superb, introducing ideas in their own time and allowing the music to build and disperse with clarity and great effect. Meyers is a superb vocalist, who's voice ranges from girlish pop to operatic drama, always with strength and assurance, while Cattivelli is a strong player with a powerful and expressive voice. The words are presented in the original languages of the poets - Italian, English, French and German. Interspersed electronics supplement the sophistication of the compositions, both as transitional pieces or to augment the excellent rapport of the musicians. "Reigen; Bufera" is a good example of their thorougly modern and open-minded approach, an 11 minute piece that starts strongly in something akin to Henry Cow meets Amy Denio, followed by Meyer's subtle singing of the poem in German. The music settles down to a sparse interaction of bowed cymbals, violin and electronics, with Meyers eventually returning in a soft voice speaking over the improvisation. The piece swells and recedes as Meyer's voice aches over the words, while Cattivelli squonks and squeals in response. Meyer recedes again as the improvisation picks up, only to return as a scratchy and distant recorded voice with the music transitioning into something frantic and scratchy itself. This piece is followed by "My Boyfriend," a piece with an Amy Denio feel where Meyer sings "my boyfriend is an ashtray, and he's perfectly useless." Further comparisons to Motor Totemist Guild, Henry Cow or work by Jean Derome won't do justice to the diversity of the pieces or the strength of the ideas that created them. One of the most superb records you've probably never heard of.